Stan Bayliss, a forward, learnt his rugby at the NationalSchool, Gloucester. He graduated into the local St Mark’s team, where he came to the attention of the City club, and was drafted into the Gloucester A side. Stan stepped up into the Gloucester 1st XV for the first time late in the 1919-20 season; he had a tough baptism away at Llanelly on 20th March 1920 when Gloucester were defeated 5-29. However, Stan had made a mark, and made 4 further appearances before the end of that season. However, he struggled to gain a place in the first team the following season, 1920-21, making only 4 appearances. 1921-22 saw him break through into a regular place in the first team under the captaincy of Sid Smart. 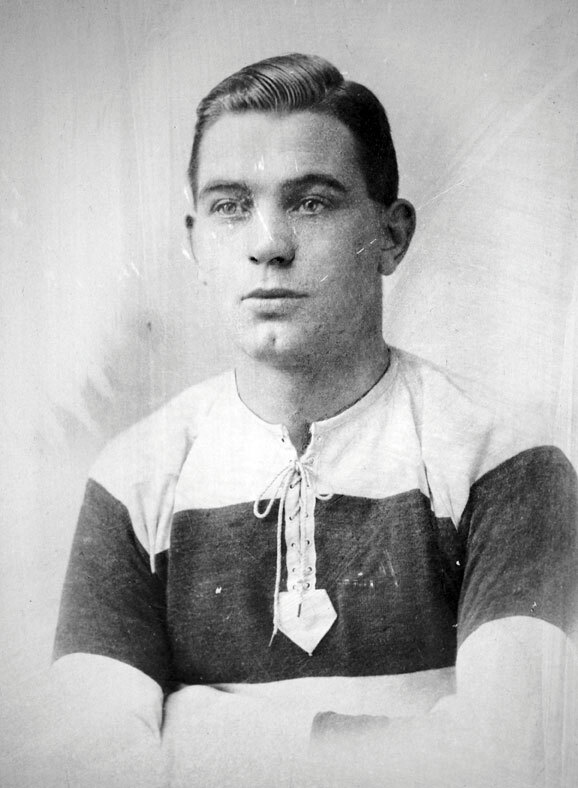 Stan played in 17 of the 41 fixtures that season, and scored his first try for the Club at Kingsholm on 17th December 1921 in a 22-0 win over Cheltenham, later adding a second against Clifton. Stan first appears on the Gloucester Honours boards in 1922-23, when he appeared in 32 of Gloucester’s 43 matches. He scored a try at Twickenham in a famous 11-0 victory over Harlequins, and followed up with further tries against United Services (Plymouth), Cinderford, Llanelly and Cheltenham. 1923-24 saw Stan take the field for Gloucester on 28 occasions, out of 39 matches played, with tries against Pontypool and Cross Keys. This season also saw Stan’s debut for the county, when he played in all 3 of their County Championship matches – they won against Devon and Cornwall, but slipped up against Somerset, which saw them eliminated. Stan’s career record was 102 games played and 11 tries scored. “The tragic death of Stanley Bayliss, one of the saddest events in the history of the Gloucester Football Club, has evoked widespread sympathy and regret far beyond the confines of the city and county. In the prime of life, with a promising business future, Stan Bayliss had bright prospects before him and he was held in the highest respect and esteem by all with whom he came in contact. I knew Bayliss best as a footballer – and he loved the game and played it well as a sportsman and gentleman – but those who had a more intimate companionship speak of him as a good son and a devoted husband and father. Of a genial disposition, bright and cheerful, Stan Bayliss was always good company, and he helped to pass away many an hour on those long train journeys which the team are called upon to make when playing away from home. Amongst his colleagues, and no one was more popular, his loss is well-nigh irreparable, and one hardly likes to contemplate what the next out match will be like without our late friend. At the inquest on Thursday Dr Arnold Alcock, President of the Gloucester F C, and the Coroner (Mr G Trevor Wellington) – himself a keen Rugby enthusiast and supporter of the City team – paid tribute to Bayliss’ worth. The medical evidence showed that deceased dislocated his neck, and it was further shown, on the testimony of Mr George Romans (the referee) and Doctor Taylor (who was a player in the match), that the game was quite free from any foul or rough play. The Citizen launched an appeal to collect funds for Stan’s widow and child, which resulted in £1,500 being placed in the bank to the credit of the “Stanley Bayliss Fund”. The Trustees of the Fund were Dr Alcock, Messrs W T Pearce, A F Fielding, G H Bland, J T Brookes, C A F Ridsdale, Arthur Hudson and W H Madge. They decided that the fund should be invested in trust securities, and that the income from those investments be expended for the benefit of Mrs Bayliss and her son. Should Mrs Bayliss re-marry the whole of the income was to be appropriated for the benefit of her son. The Trustees would be at liberty to use capital, at their discretion, for apprenticing the son to some trade or making provision for his advancement in a similar way. After her son had attained the age of 21 years the Trustees might, at any time, transfer the whole or part of the capital to him for his own use, should they consider it reasonable to do so. Such a step would not, however, be taken during the lifetime of Mrs Bayliss should she remain a widow. In 1946, the Fund was wound up. Mrs Bayliss had remarried. Some of the money had been spent on bringing up and educating her son, who had now reached the age of 21 and was in the Services, so he was paid the residual sum of c£1,000.